Mostafa Bassim at a Halal restaurant in Alexandria, VA, that he often frequents with his Egyptian friends / Cecilia Butini. Each Sunday, in a co-working space just a few blocks from the Capitol in Washington, DC, half a dozen men and women from Egypt meet to discuss the current state of their country and to brainstorm ideas to make an impact from afar, or to help their fellow citizens there. Mostafa Bassim, a 28-year-old with thick curly hair, lounged on a couch in the wood-floored space on a Sunday afternoon, a grave expression on his face as he started to recount the day his life changed. In November 2013, as Egypt transitioned from Mohammad Morsi’s brief presidency to the military rule of general Abdel Fattah El Sisi after a coup, Mostafa was in the middle of a protest in Alexandria, on Egypt’s coast. He wasn’t there to protest, but to take photos for a national publication named Veto. As he got closer to take photos of two police officers arresting and beating a protester, one officer turned to Bassim and started beating him too, he said. “I was trying to tell him, I’m working with a newspaper… I didn’t have back then an ID for the newspaper I [was] working with, I had just started my job,” Bassim said. But that didn’t stop the targeting. Egypt’s 2013 protest law allowed authorities to use force to disperse demonstrations, and journalists were often caught in the crossfire, a practice well documented by advocacy groups like Human Rights Watch. According to Reporters Without Borders, as of October 2017, 17 journalists were jailed in Egypt. “So they started to beat me, took all my equipment, took my money, everything, and they brought me in a truck for eight hours,” Bassim said. The truck, he said, was some like an open toilet for the 40-50 men who were locked in there together, with the smell of human excrement becoming unbearable. “There wasn’t enough air inside and it was so hot. ” he said. What happened after that was proudly displayed by the then interior Ministry of Muhammad Ibrahim Moustafa in a post on the ministry’s social media account, with a picture of roughly 50 men with Bassim right in the middle. The men were sitting in a courtyard surrounded by police officers armed with batons. “Today we arrested some terrorists,” the ministry declared. 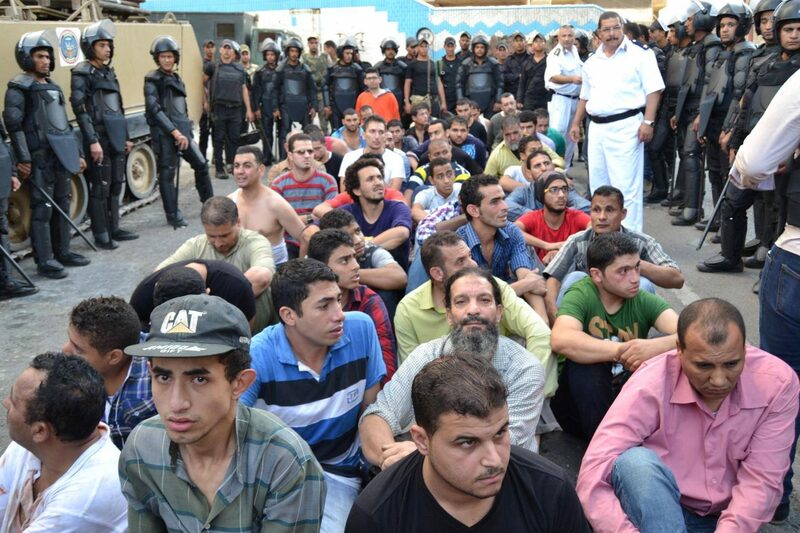 Bassim (center) and other detainees in a picture published by the Egyptian Interior Ministry on Nov. 1, 2013 / Facebook. Arrested for taking pictures. Not an uncommon fate for media workers in post-military coup Egypt. Shawkan’s name was heard the world over as major human rights organizations campaigned for him, but his case is hardly the only one. “We have documented thousands of cases of journalists and even photographers who were detained over the years since 2013 in Egypt, and their cases usually happen when they cover anti-government protests,” said Sherif Mansour, and activist and Middle East expert with the Committee to Protect Journalists. 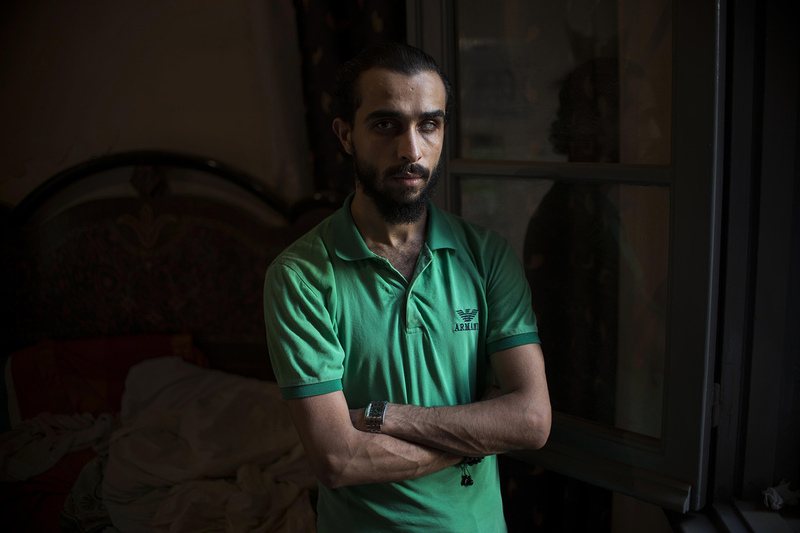 His time in detention was, to Bassim, the hardest of his life. “They said to us that we would never see the sun again,” he said of the police. “They would ask questions, and if we answered they would slap or beat us, saying not to open our mouths. If we didn’t answer, they would do the same. You’re sitting there, you don’t know what the hell is going to happen to you.” To him, not knowing if his life would “stop” or not – an expression he used to refer to detention without trial – was the worst. After three days in detention in Alexandria, a fellow journalist came to secure Bassim’s release. Suddenly, the police were friendly, he said. They apologized, said they didn’t know that he was an accredited reporter, and let him go. The journalist was another reporter from the Alexandria bureau of Veto, Bassim’s employer. The paper had powerful connections. What had prompted Bassim, a trained IT technician, to pursue documentary photography and reporting was the reckoning that if he had just participated in the Egyptian revolution as a protester without documenting it, maybe nobody else would have. “I’ve seen in the revolution people die, people shot, but to see that as you document… I knew I was doing something important,” he said. If Bassim’s choice to become a photojournalist wasn’t accidental, his taking part in the revolution somehow was. On January 28, 2011, only three days after the Tahrir Square protests in Cairo broke out, Bassim was going to play soccer with friends after Friday prayers. Another man joined Bassim on the couch in Washington as he told the story. That man, Ramy Hafez, had been the leader of one of the first protests in Tahrir Square, and one of the founders of the Egyptian Democratic Institute, a parliamentary watchdog. He now lives in DC in exile following the Egyptian government’s recent crackdown on NGOs. Hafez said he was leading a protest in Bassim’s neighborhood in Cairo, Helwan, on that day in January 2011, when Bassim realized that the friends he was supposed to go play soccer with were joining the protest. Bassim joined them. Hafez remembers seeing Bassim at protests over the following years, first as a protester, then as a photographer, until the two men lost touch. They met again in 2017, at a Halal restaurant in Washington where both Hafez worked and Bassim went to search for work. Egypt has increasingly become one of the worst countries in the world to be a reporter, according to the Committee to Protect Journalists. Staff reporters don’t face the same level of risk that freelancers do, but the price to pay for them is a heightened level of censorship from the news organizations they work for. Back in Cairo after the arrest, Bassim set out to pursue a project of his own – to document the effect that post-revolutionary government repression was having on young activists. From young women who decided to stop wearing a niqab, to youth questioning the authority of religion, Bassim scouted out people from different neighborhoods in Cairo, took their pictures, and had them tell their stories of rebellion and repression. But while he was doing this in his free time, he decided he needed to continue having the protection that working for a big news outlet might provide, So he took on a job at El Watan, a pro-government daily newspaper. The editor, Mustafa Mosad, soon found out about Bassim’s other projects, and started telling him to stop. Bassim ignored him. The Magnum Foundation had just awarded Bassim a grant to pursue his project and to present it in a series of workshops. He had to finish it before he could go to the first workshop in Beirut in 2016. After the 2013 military coup that brought Sisi to power, some Egyptian newspapers, including Veto and El Watan, were acquired by the state security sector, including the intelligence services. This came after the Egyptian press enjoyed a short period of relative freedom, about two years after the revolution and until the coup. 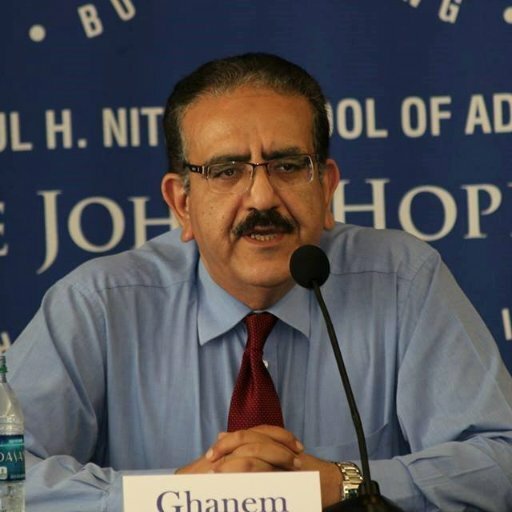 Yehia Ghanem, a senior Egyptian journalist exiled in the U.S., said that press freedom in the transitional time between Morsi and Sisi was unprecedented in the history of the country. “It was like somebody was strapped on a wheelchair, and then suddenly the miracle happens,” he said. But it didn’t last long, and with the new rule, the acquisitions of news outlets by state apparatuses choked press freedom to a worse point than it was before the revolution, under former dictator Hosni Mubarak’s rule. Ghanem, an esteemed war reporter from Egypt, was tried in 2012 in Cairo together with many other Egyptians with connections to foreign NGOs. He fled to the U.S. and faces forced labor should he return to Egypt. As the deadline to present the photographs to Magnum approached, things weren’t going well with the editor at El Watan. Bassim kept asking for time off and not getting it. The editor kept referring to Bassim’s 2013 arrest as a way to deter him from further pursuing his project. “He was threatening me, but still in a good way,” Bassim said of the editor. “He was telling me to be careful.” Until it wasn’t ‘in a good way’ anymore, and the threats became real – threats that Bassim would be put in prison again if he didn’t drop the project. But he didn’t stop. He presented the project at a workshop in Beirut, and then at the New York Times Portfolio Review at the start of 2017. That is how Bassim arrived in the U.S. – just like any other professional on a work trip – until one evening during his stay, when he received a call from home. “Colleagues that I worked at El Watan with called me. The boss was telling them that he could put me in prison, thinking that I was in Egypt at that point.” The project, with the bold title Revolution of The Mind, had just been published online. As he took the call from Egypt, Bassim left a table at a café in Queens where he had been sitting with friends. He walked around the block and then to a park, talking on the phone with colleagues who were advising him not to go back, at least for a while, he said. That was April 2017. Not only has Bassim not gone back to Egypt, but he is now bound to be out of his country for a while. His asylum application should be processed soon, and he said his lawyer is optimistic about it. “Post-revolutionary Social Change in Egypt” by Mostafa Bassim. Awarded in 2016 with a Magnum Foundation grant. A recent change in asylum regulations has applications processed on a “Last-In, First-Out” basis, meaning that the most recent requests will be processed before the older ones. Bassim, who only recently filed his, should be interviewed shortly. Once the person gets interviewed, U.S. government magistrates will determine the truthfulness of the person’s claim. Once that’s done, the processing time starts. In high profile cases like journalists and academics it can take longer, up to one or even two years, said Jason Dzubow, an asylum lawyer in Washington, DC. Dzubow recently assisted Egyptian asylum applicants, and all their claims were granted. But there are very few certainties in asylum cases. “It’s very common that people from Muslim majority countries are delayed and there’s no known reason for that,” Dzubow said. Once asylum is granted, the recipient must reside in the U.S. for a year before obtaining a green card. That is what Bassim is going to do, too, though he never intended to live in the U.S. in the first place, and had to rethink his future. Since that evening in New York when he realized he wouldn’t be able to go back, he decided to move to Alexandria, Va. (a place he didn’t choose because it is the same name of his home city in Egypt) and started to work odd jobs to cover his expenses. With no official status, he hasn’t been able to get gigs as a photographer. He works at a halal restaurant almost two hours away by bus from his apartment in Alexandria, and tries to study in his free time to be able to apply to graduate school programs in photojournalism. Bassim said he feels optimistic about getting asylum, though the prospect of remaining in the U.S. for a long time worries him a little. “I would like to go back, if not to Egypt, to the Middle East. And work as a photojournalist there,” he said.